Thousands of protesters in Hong Kong rallied Tuesday evening to mark the one-month anniversary of police use of tear gas against demonstrators blocking roads. With many holding up umbrellas and some wearing workman's goggles, they fell silent for 87 seconds in remembrance of the 87 times police fired tear gas September 28. 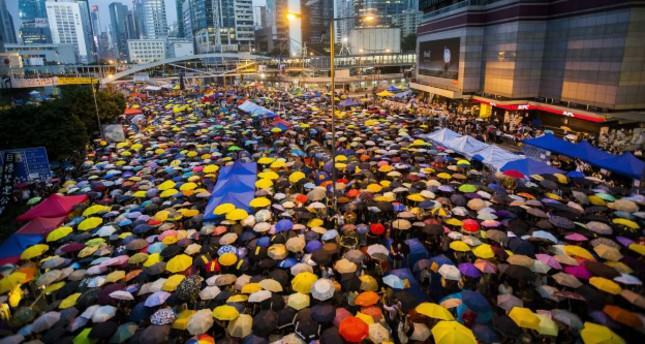 The mass civil disobedience action has been dubbed the "umbrella movement" because protesters have en-masse used umbrellas to defend themselves against pepper spray. The use of the tear gas had shocked the city, prompting thousands more to join the protests. The rally came as student leaders released an open letter to Chief Secretary Carrie Lam detailing conditions for further talks with the Hong Kong government. The Hong Kong Federation of Students said in the letter that for a new round of talks to be fruitful, the government should submit a report to Beijing that reflects demands for free elections in the city. It added that if the Hong Kong government cannot meet their demands, students would like to have talks with China's premier, Li Keqiang. "We think the government's proposal to submit a report to the State Council about people's reaction is an attempt to step forward," student leader Alex Chow said at a press conference, adding that the Federation of Students would explain "Hong Kong's real situation" to the Chinese premier if the government could not. As the movement enters its second month, the standoff between protesters and the government appears to be at a stalemate. Protesters say they won't go home until the government commits itself to an electoral system with civic nomination, and talks last week failed to achieve any breakthrough. In August, Chinese leaders ruled that while Hong Kongers could choose their next chief executive in the 2017 elections, the candidates would first have to be approved by a 1,200-member nominating committee -- which protesters suspect would be stuffed with party loyalists. The demonstrations are seen as the biggest challenge to Beijing's control since the territory was handed over in 1997.